Fruit tree catalogs make it easy and convenient to start a home orchard. Whether you're looking for dwarf apple trees or standard sized pear trees, fruit tree catalogs open up a wide world of choices to the backyard gardener. Fruit tree catalogs tantalize with their glossy photos. However, it's important to understand the symbols and text to ensure wise choices. One of the most important things to understand within the text of each entry in the catalog is the size or height of the variety. Fruit trees typically come in dwarf, semi-dwarf and standard varieties. Dwarf trees are usually no more than 10 feet tall. These are often recommended for home gardens because they're easier to tend. You can easily reach the fruit for harvest or pruning, spray the limbs, or prop up branches when they become too heavy with fruit. Semi-dwarf trees fall somewhere in between dwarf sizes and standard sizes. They may range from eight to twenty feet tall, depending on the variety. Standard sized trees can grow as high as 30 to 40 feet. These are the same size trees as commercial orchards grow and they bear a lot of fruit. While majestic in the landscape, they're often too big for backyard gardeners to tend to. The average home gardeners chooses dwarf trees. The fruit is just as tasty as from the other size trees, and they can be cared for easily by even a novice gardener. If space is an issue, as it is for most people, dwarf trees also provide greater variety with less need for space. Another important thing to note in the description for each tree in the catalog is whether or not the trees are self-pollinating or need a pollinator. Trees bear fruit after insects, butterflies or wind pollinates, or fertilizes, the flower. The insect carries grains of pollen from one flower to another. The pollen then fertilizes the flower, which in turn develops into fruit. Some trees need the pollen of another species in order to set fruit. Apple trees are one of the types of fruit trees that often need a pollinating species. A good fruit tree catalog will specify which varieties pollinate which varieties. If a variety is specified, you actually need two trees, one from each variety, in order to get fruit. You will get fruit from both trees, but if you plant only one and there is no other pollinating tree in the vicinity, you will get blossoms but no fruit. One other important thing to note about trees that need a pollinating variety is that they often have specific requirements for how close they need to be planted to their pollinator. A good catalog will tell you this information, or you can find it in a basic home orchard gardening book or from your state cooperative extension office. Your gardening zone determines which trees can be planted and when to plant them. Some types of fruit trees like certain zones better than others. McIntosh apples, for example, need the colder winter months of zones 4 through 6. They will not set fruit or will set it poorly in the warmer zones of 7 and above. Peach trees, however, love it warm, and fare well in zones 7, 8 and 9. You can often find special hybrids of various fruit trees that have been bred to thrive in your gardening zone. Even if you can't grow McIntosh apple trees in North Carolina, you can grow many other tasty varieties for eating or cooking. 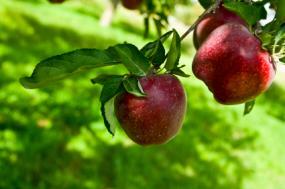 Below is a selection of great fruit tree catalogs that list everything from apple to paw-paw. Visit the website to request a catalog. Most companies enable you to buy online too. The Arbor Day Society is a non profit organization dedicated to encouraging people to plant trees. They sell fruit trees and all profits go back into the society. The trees are small and some are like sticks when they arrive. They are inexpensive. Because of the size, they will take time to become established, but these smaller trees will be just as productive once they take root and grow. If you don't mind the wait, you can buy a lot of trees for a little bit of money, and the money goes to a great cause. Stark Brothers is a favorite for city-dwellers because they offer miniature fruit trees as well as dwarf, semi-dwarf and standard sized trees. Miniature fruit trees can be grown in pots on balconies and decks. While they yield only a few pieces of fruit, they can be very fun especially for those living in apartments. Johnson Nursery offers everything from nut and fruit trees to ornamental shrubs. They cannot ship to California, Oregon and Washington due to state regulations but they will ship to the remaining states. Whether you want just one tree for a fun backyard gardening project or a whole orchard, ordering from catalogs brings the world of fruit trees right to your doorstep.